After Disentis (CH 1994), Chamonix (F 1996), Garmisch- Partenkirchen (D 1998), Bergamo and Castione della Presolana (I 2000), Alpbach (A 2002) and Kranjska Gora (SI 2004), the seventh ForumAlpinum was hosted again by Switzerland from April 18th - 21st, 2007. As in 1994, the Swiss venue was Engelberg, a historic location famous for its monastery. Some 230 scientists, stakeholders, politicians and interested laypeople responded to the invitation to discuss various aspects of "Landscape Development in Mountain Regions" at this years ForumAlpinum, extended by the International Scientific Committee for Alpine Research Iscar, the Swiss Academy of Sciences Scnat and the Swiss Academy of Humanities and Social Sciences SHS. The choice of topic was related to the Swiss national research programme "Landscapes and habitats of the Alps" (NRP 48), realized between 2001 and 2007, but to be discussed in a broader alpine and European context. Four plenary sessions dealt with "values and valuation", "transformation processes", "cooperation and decisionmaking in landscape management" and "the role of landscape in a changing society". The plenary sessions with talks by various speakers were complemented by thirteen workshops, a poster presentation, four project & programme fairs, film presentations and two excursions. Participants and invited guests spent the official evening on the Titlis (3020 m asl), an impressive peak on which Edwin Bernbaum, Head of the Sacred Mountains Programme of The Mountain Institute, Berkeley, USA, enhanced our awareness of sacred mountains around the world. These proceedings summarize the results of the 7th ForumAlpinum. I trust that issues addressed at Engelberg will encourage further research and programmes to provide our society with greater knowledge in managing mountain landscape as a cultural heritage and resource for development. 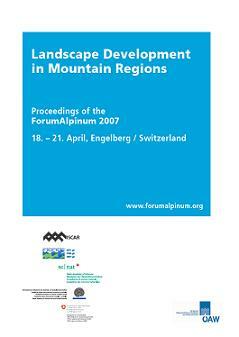 The next ForumAlpinum will be integrated into Alpweek 2008 and focus on innovation processes in the Alps. Alpweek 2008 will be held from June 11th - 14st, 2008 at LArgentière-la Bessée, France, in the south-western Alps.